On the left is Cosmo DiNardo, 20, of Bensalem. On the right are the four missing men, clockwise from top left: Jimi Tar Patrick, Thomas Charles Meo, Dean Andrew Finocchiaro and Mark Richard Sturgis. A Bucks County man confessed to murdering four men on Thursday, four days after investigators began searching his family's Solebury Township farm for the bodies. 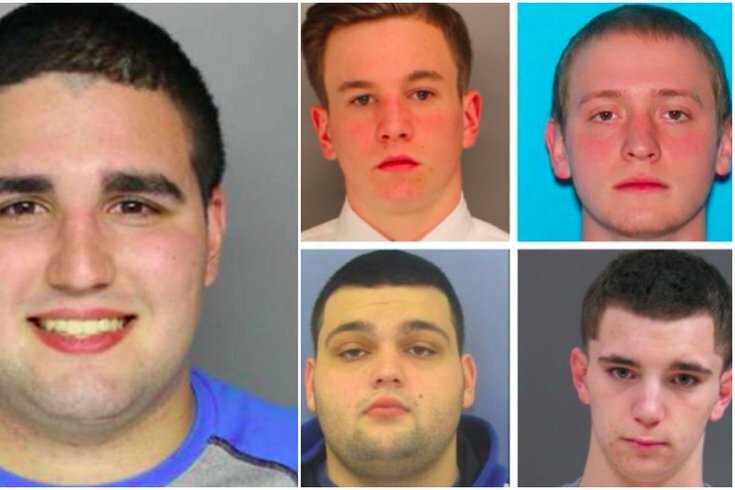 Cosmo DiNardo, 20, confessed to participating in the killing of Jimi Taro Patrick, 19, of Newtown Township; Mark Sturgis, 22, of Pennsburg; Dean Finocchiaro, 18, of Middletown Township; and Tom Meo, 21, of Plumstead Township, according to multiple media reports. Wednesday, July 5: Jimi Taro Patrick, 19, of Newtown Township, Bucks County, is last seen. Friday, July 7: Three other men – Mark Sturgis, 22, of Pennsburg, Montgomery County; Dean Finocchiaro, 18, of Middletown Township, Bucks County; and Tom Meo, 21, of Plumstead Township, Bucks County – go missing. Saturday, July 8: A neighbor and her husband who live in the area of the Dinardo family farm near Route 202 and Aquetong Road in Solebury Township hear four rounds of gunfire coming from the general direction of the farm. Susan Coleman later told PhillyVoice that she and her husband, Keith, heard numerous, reverberating sounds of shotgun fire. "It was violent," she said. "This person was going bananas." Sunday, July 9: Police begin searching for the missing men on the DiNardo farm. Meo's 1996 Nissan Maxima is found in a garage on another property owned by the DiNardo family. His diabetes kit – which Meo needs to survive – is found inside the vehicle. Monday, July 10: Police arrest Cosmo DiNardo, 20, for an illegal possession of a firearm and ammunition, because he had been involuntarily committed to a mental health institution. The charge, which stemmed from an incident in February, previously had been dismissed by a judge. But prosecutors refile the charge. DiNardo is held on 10 percent of $1 million cash bail. Bucks County District Attorney Matthew Weintraub says he suspects foul play is involved in the disappearance of the four men. He calls DiNardo a "person of interest" but said he is not a suspect. Sturgis' father confirms that his son's vehicle was found at Peddler's Village in Lahaska, four miles from New Hope. Tuesday, July 11: Investigators, including the FBI, Pennsylvania State Police and five local law enforcement agencies continue searching the DiNardo farm. They use cadaver dogs, a backhoe and other construction equipment to search the sprawling farm. DiNardo is released Tuesday night after his father, Antonio, posts his bail. Wednesday, July 12: At a morning press conference, Weintraub announces that investigators had recovered important pieces of evidence. He says no human remains have been discovered – yet – but declines to elaborate on the evidence. DiNardo is charged with stolen property and theft for allegedly attempting to sell Meo's car for $500 to a friend. He is arrested and held on $5 million bail. Weintraub says DiNardo "may be enveloped in a larger set of circumstances." Thursday, July 13: At midnight, Weintraub announces that investigators found the remains of Finocchiaro in a "common grave" on the DiNardo farm. He says investigators do not know whether the other human remains belong to Patrick, Sturgis or Meo. Weintraub confirms police are dealing with a homicide situation. "No doubt about it," he says. "We just don't know how many homicides." At an 11 a.m. press conference, Weintraub urges anyone with tips to call a new FBI tipline at 1-800-CALL-FBI. Shortly after 5:30 p.m., DiNardo's attorney, Paul Lang, told reporters that DiNardo confessed to participating in the murders of all four men, according to media reports. The confession was part of a deal made with the district attorney to avoid the death penalty. Later that night, a Northeast Philadelphia man, Sean Kratz, 20, is taken into custody by Philadelphia police at a home in Oxford Circle as a second person of interest in the case. He is transferred to Bucks County authorities for questioning in the murder investigation. Friday, July 14: Shortly before a scheduled 2 p.m. news conference in Doylestown, news breaks that both DiNardo and Kratz are charged with murder, robbery and other charges. The affidavit of probably cause details the slayings of the young men over a three-day period. At the news conference, Weintraub defends the deal he made with DiNardo to secure his cooperation as to the location of Jimi Patrick's body, which was buried in a six-foot grave on top of a mountain as much as a half-mile away from the deep grave where remains of the other three men had been found. "We'd still be looking for Jimi Patrick if we hadn't made that deal," said the district attorney, noting that DiNardo's cooperation also enabled authorities to charge Kratz.